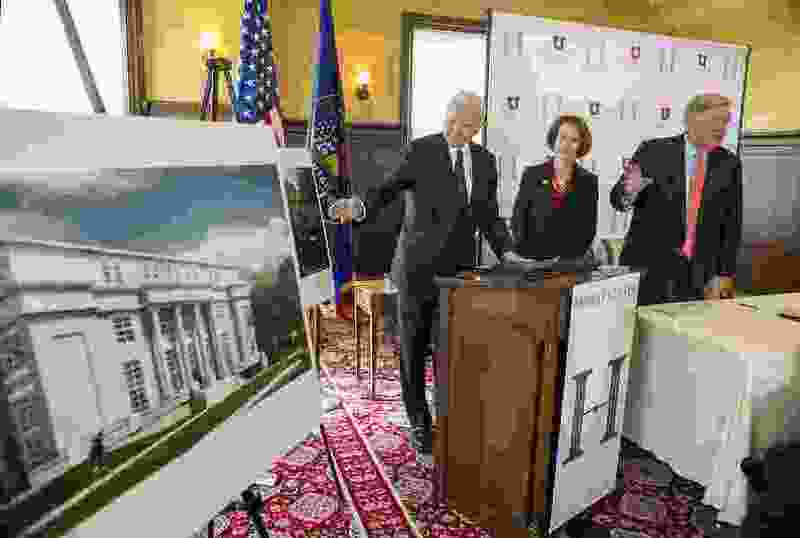 (Leah Hogsten | Tribune file photo) l-r, Then-Sen. Orrin G. Hatch, University of Utah president Ruth V. Watkins and Kem Gardner with The Kem C. Gardner Policy Institute during announcement and unveiling of the Orrin G. Hatch Center, May 2, 2018. The Hatch Foundation and the U. plan to erect a new facility to house the former senator's archives from his 42 years in the Senate as well as to offer forums to help train future leaders and discussions of policy. The new facility will be located across the street from the Thomas S. Monson Center at 411 E. South Temple and will honor the legacy of Utah's long-serving senator. Washington • Supporters of former Sen. Orrin Hatch are asking the Utah Legislature to donate $2 million of taxpayer money to help fund a new center in Hatch’s name in Salt Lake City. Meg Holbrook, a former chairwoman of the Utah Democratic Party and now a top executive at Zions Bank, pitched the idea to the Business, Economic Development, and Labor Appropriations Subcommittee on Thursday, saying the public would benefit from the center. “Its overall goal is to, one, store [Hatch’s] papers, which are invaluable,” she said, adding incorrectly that Hatch was the longest-serving senator in history (he’s the sixth-longest serving but is the longest-serving Republican senator). The center, which is partnering with the University of Utah and plans to erect a building that includes a replica in downtown Salt Lake City of Hatch’s office, is aiming to raise $40 million initially. Previously, the Orrin G. Hatch Foundation had sought private money. “It’s just in its infancy; we’re starting,” Holbrook told lawmakers. The legislative subcommittee did not act on the request, which was placed on the agenda at the request of Senate Majority Leader Evan Vickers, R-Cedar City, or that from other groups seeking state funds in a series of quick pitches. The center, which has been criticized as a vanity play, is geared toward being an archive for Hatch, who retired last month after 42 years in the Senate, as well as an institute to help train future political leaders. It’s modeled after a center created for the late Sen. Ted Kennedy, a Massachusetts Democrat who worked with Hatch on landmark legislation. The Hatch foundation didn't immediately return a call for comment on whether it would seek further taxpayer money. Hatch left office with about $900,000 left in his campaign account. Under federal law, he could donate that amount to his foundation, which is a nonprofit. The foundation does not have to make public its donors. Its last filing with the IRS, in 2016, showed $5.8 million in contributions with total assets of $5.3 million. Its only payments listed are to the Larrison Group, a Washington-based fundraising firm that previously worked for Hatch’s campaigns. The foundation’s chairman is Zions Bank President Scott Anderson and treasurer is listed as former Oregon Sen. Gordon Smith, a Republican who shares Hatch’s Latter-day Saint faith.